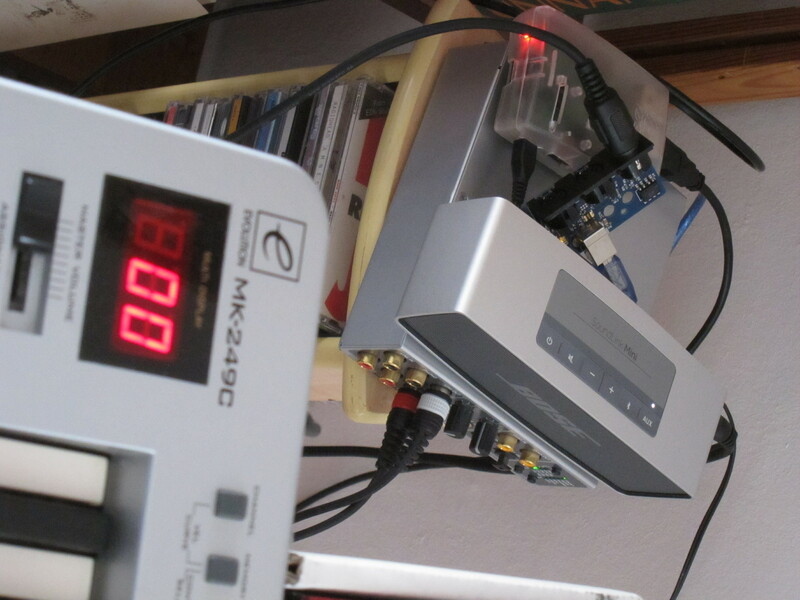 The Raspberry Pi Controller is intended to be a stand-alone MIDI sequencer workstation, made with open-source software and DIY electronic components. It is built around a Raspberry Pi board delivering a solid user interface. 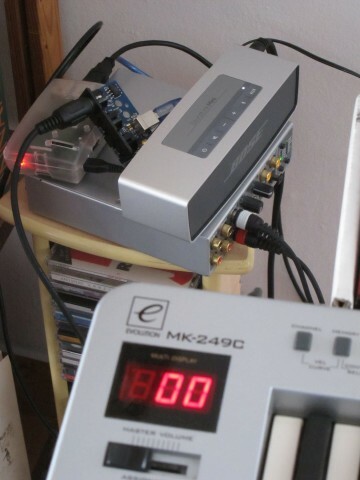 The I/O connections are served by an Arduino feeding directly to four MIDI inputs and outputs, guaranteeing accurate timing. The name pays homage to the venerable Akai MPC series, but this is going to be a whole new kind of beast. If this project is of interest to you, or if you would be interested in having your own little RPC (DIY, kit or pre-built, doesn’t matter) please drop me an email, tell me what you want to see me accomplish, and I will add you to the news email list. You’ll be the first to hear of updates, and I will be aware if someone actually wants one! No spam. The DSP synthesizer project has taken most of my attention lately, with the RPC making steady progress on the background. The unique synthesis algorithms of the synth will make it a beast of a companion for the RPC. 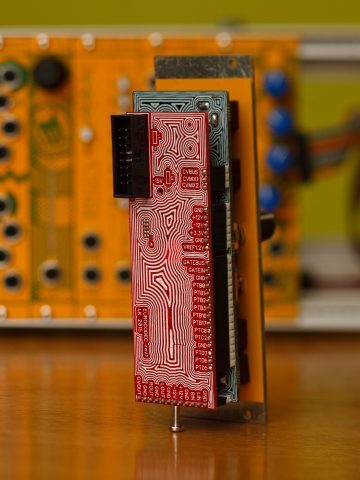 We wanted to start making DSP-based modules for the Eurorack modular synthesizer format. The problem was just that there is no easy way to get started; there are no evaluation boards on the market made for this purpose, so you always need something custom for every project. So I decided to make one. 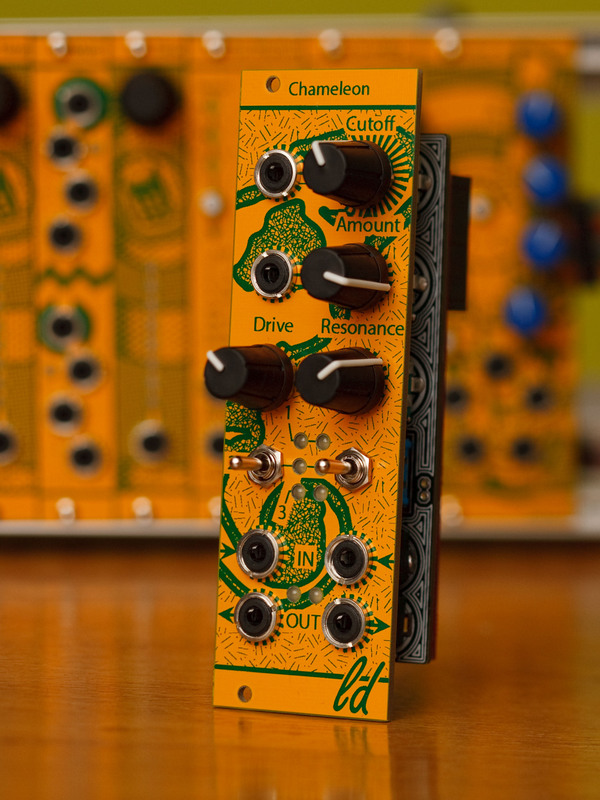 Eurorack is a relatively simple platform: it provides you with dual power supplies (+/-12V), a standard signal level of about 10V p-p, and control voltages roughly in range 0-5V. Pitch control is in 1V/octave; one volt increase in a pitch control voltage should double the pitch of a controlled oscillator. 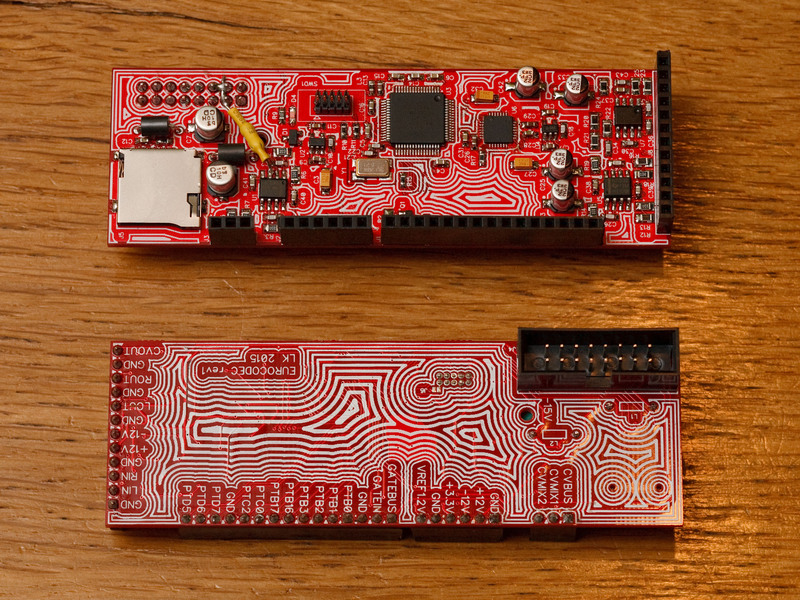 You want to write DSP code, so you need a DSP processor. Everything is ARM these days, and with the good experiences with the KL26, we decided to try the Kinetis MK22F series. This one has hardware floating point support (single precision) and set of integer DSP instructions: it can do integer MACs in 1 clock, with a 64-bit accumulator! At 120 MHz! The board would also need some way to get audio in and out of the processor, and the standard way to do that is to use an audio codec connected over an I2S bus. After some searching I found the AK4558 stereo codec, which has some very intriguing capabilities. It allows you to select between different antialiasing filters, some with very short group delay! 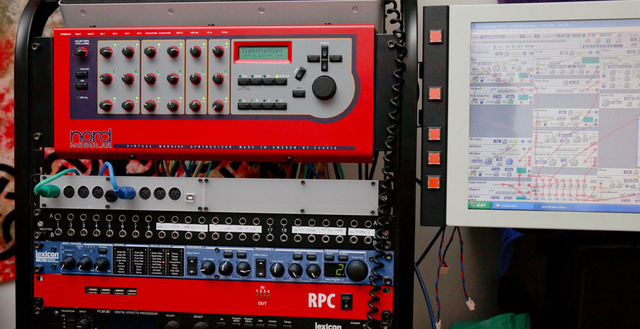 The codec can also run at 192 kHz sample rates, which, combined with low-latency filters, means that the total latency for passing audio through the CPU is very low. It’s not zero, so if you mix the processed output with the input, it will still result in phase interference, but it looked very promising for short delaylines. What else do we need? Not much, really. I wanted to have a module that could be used for development, or plugged in to an Eurorack module frontpanel for placing it in a rack. Voltage conversions have to be provided off the board: gate signals have to be adapted to (and from) 3.3V range, and adding more CV output signals needs an external DAC. But those can be added on the front panel boards. And here’s how it looks like when plugged in to a frontpanel! The rack PC mount was another small side project. I have had that Nord Modular for some 13 years. Now finally I got its editor running in the place where it belongs, right next to the synth! The PC and screen are from ebay, with the PC hiding behind the display. The mount for buttons and the PC was manufactured Protocase. Some wires are still sticking out, the buttons are not hooked up yet. Mellotron is one of those curious instruments that are impossibly difficult and expensive to own, but so deceptively simple and expressive that when you get to play one, you can’t let go of it. So of course I want one. Note: you will need an audio interface that works with Jack. This will define how playable your new instrument will be! You will also need a MIDI interface, such as the USBmidi2, but any Linux-compatible audio interface will do. The purpose of this post is to demo the USBmidi2. So I have one of those for connecting a MIDI keyboard. It will let you plug in a laptop also. For the audio I used an old Terratec audio interface that I was familiar with. You can use any audio interface that you can get Jack to work with. The Raspberry Pi’s internal headphone jack will also “work”, kind of, but it requires so long buffer sizes that it’s unusable. The Mellotron sample bank is available on the LinuxSampler instrument page. Sorry, this part I will not explain here in detail. I used jackd2 and qjackctl. I was able get a latency of 2.9 ms at 44.1khz (according to qjackctl)! You have to make sure that your Pi is configured to output audio at the minimum possible latency with minimum glitches, before you continue. LinuxSampler is available in the official SVN repository. See the LinuxSampler download page for details. Build libsf2, libgig, and liblscp in that order. Some of them may require some variation or some commands were unnecessary; I will make better notes if I have to do this from scratch. Make sure the make and make install steps finish completely before continuing to the next. LinuxSampler does not support the ARM CPU of the Raspberry Pi out of the box. Luckily someone has already fixed this, and the necessary patches are available here. You need both the RTMath.cpp patch, and also the attached atomic.h.diff patch. Or you can just grab them from my site. patch < ~/RTMath.cpp.diff patch -p2 < ~/atomic.h.diff cd ../..
Those perl scripts required XML::Parser to run, but I think that installing ‘intltool’ adds the necessary dependencies. If not, make sure to see “Installing packages system-wide” before going on installing all the Perl libraries with cpan. This will take some time if you do it on the Pi, and it will require several hundred megabytes of disk space. You should now be able to run ‘linuxsampler’ in a shell on the Pi. LinuxSampler allows the GUI to run remotely. You can build qsampler to run on a more powerful computer, and connect to the Pi with it. The sources are in the same subversion repository. Extract the TaijiguyGigaTron.tar.bz2 from the LinuxSampler instrument page on the Pi. If you use qsampler remotely, the .gig file must be at the exact same path on both the Pi and your remote controller host. Make sure the green “led” in qsampler blinks when you play notes – if not, check your MIDI connections! Make sure sound comes out when the green “led” blinks – if not, check your audio connectiosn! Then copy the LSCP file to your Pi. My example LSCP file is available for download here, but I’m sure that you will have to modify it to work with your choice of hardware. There’s a nice trick to load the LSCP file from the previous step on the Pi. If you didn’t change anything else since Step 7, you should now be able to play notes with the Mellotron patch. To prepare for starting everything in one go, I wrote a simple script that kicks off Jack and LinuxSampler. OK, it’s dirty with those sleeps and all, but works pretty well for a quick hack. Debugging it is easy; you can add the -f parameter to daemon to run the programs in a terminal. That allows you to directly see the jack error messages. And when you get each step to run properly, just update the parameters in the script and continue with the next. Save everything, test it a few times, reboot, and you’re ready to rok!